Let me preface this by saying that I have the ingredients in the bread machine, mixing as I type this, so I may have made a substitution error, but will have to taste the finished product to find out for sure. I used to love cottage cheese, within the last several years, I developed a lactose intolerance and worried that my cottage cheese-days were over. When grocery shopping with my mom the other day, I found out Lactaid makes a cottage cheese and it is available where she lives. I can’t find it anywhere near me, so I won’t have it often, but I bought some while I was there and she brought me more when she came up today for a visit. Hooray, but cottage cheese does have an expiration date, so I have to find uses for it. 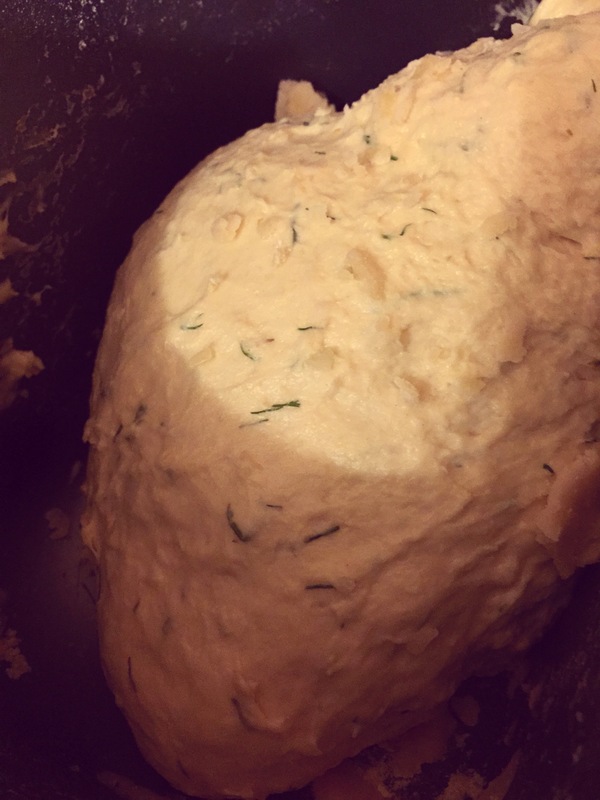 After checking the cookbook, I found two cottage cheese bread recipes and decided to start a loaf tonight. 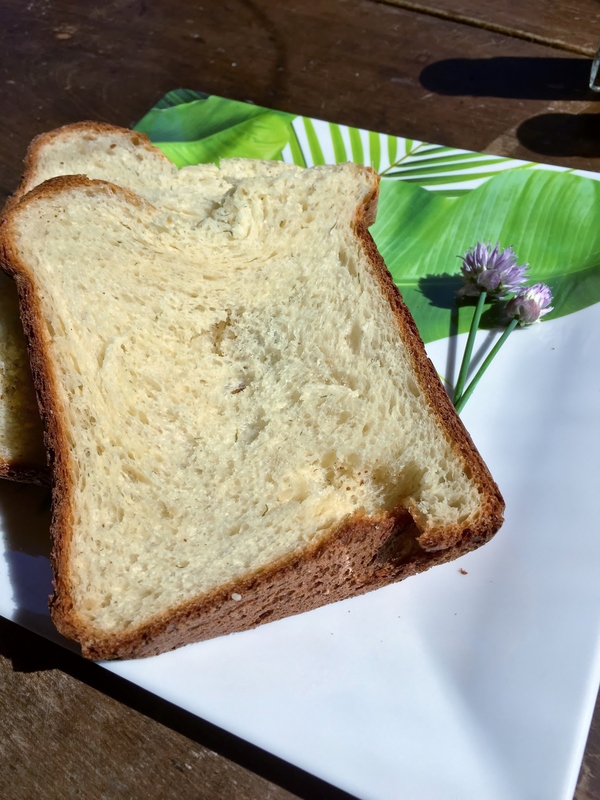 The author states that this bread will have a moist and delicate texture when done, that it makes great toast and is good in savory bread puddings. I placed my ingredients in the bread machine in the following order: 2 tablespoons olive oil, 1/2 cup chopped onion (here is the substitution I am concerned about, the recipe actually calls for 1 large shallot, chopped. I could not find shallots and decided to attempt a substitution. Cross your fingers for me. 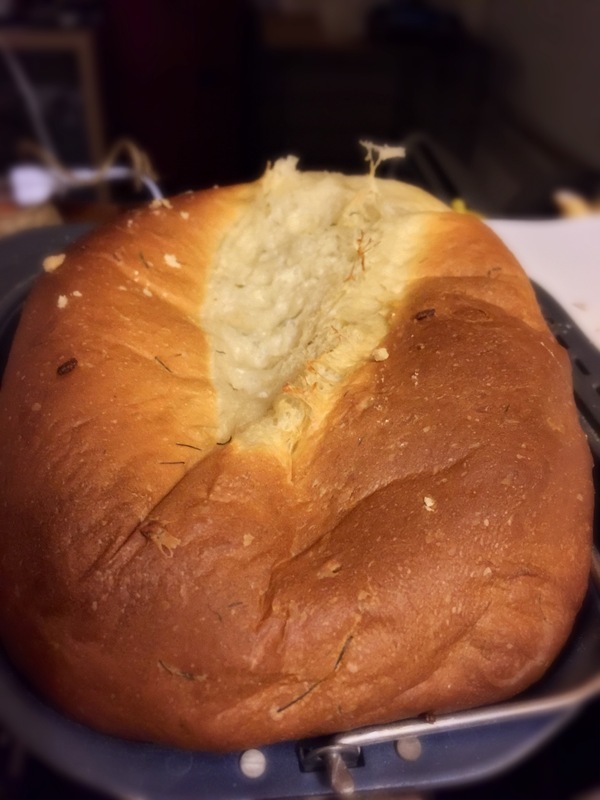 ), 1 cup cottage cheese, 1/4 cup fat free milk, 1 large egg plus 1 egg yolk, 1 tablespoon sugar, 1 1/4 teaspoons salt, 2 tablespoons fresh dill weed, 2 1/2 cups bread flour, 1 tablespoon gluten and 2 teaspoons SAF yeast. This loaf uses the basic and dark settings on my machine and should take about 3 hours to complete. Because of the milk and eggs in the recipe, this is definitely NOT suitable for use with the Delay timer. (It is quarter after midnight, what the heck was I thinking?) I think I will set an alarm for 2 1/2 hours and sleep a bit so I am not totally useless in the morning. Wow, it is hard to sleep when the house smells this good. Blended aroma of onion, dill and baking bread is really incredible. I just hope it tastes as good as it smells. I have to brag a little, this loaf is a thing of beauty. When I removed it from the pan to cool on a rack, there was a little bit left stuck to the paddle. Oh, yum. I think the onion flavor is certainly more pronounced than it would have been if I had used the more subtle shallots, but it is still quite tasty. Expect an amendment to this post including a photo of the sliced loaf and a more detailed taste test tomorrow. For now, I have got to get some sleep. It is 3:30 in the morning and I need to be up in just a few hours; I promised to make Shakshuka for breakfast. This is a lovely tasting loaf of bread. The texture is tender and chewy with a nice crunchy crust. The flavor of onion is very strong, but not unpleasant. However, the dill flavor is a little overwhelmed by the onion, using shallots would probably have made a difference there. Since mom is still here, we have been coming up with lots of ideas for using this bread. The author writes that this bread is great toasted and lovely in a savory bread pudding. It is going to be great for sandwiches, like tuna salad or grilled cheese. I also think it would make great croutons for soups or salads. For dinner tonight I am making lemon sage chicken and plan to slice some of this up to go alongside our meal.